The Annual Entry Pass was launched at the Hall of Fame today (Thursday 18 October), with visitors who book a single ticket qualifying for a free upgrade to the pass. In addition to free entry to the Hall of Fame for a year, pass-holders qualify for priority booking for Hall of Fame events, and a range of offers and discounts, including a ten per cent discount at the venue's Maia Cafe. Pass-holders also receive a regular e-newsletter featuring details of forthcoming promotions. The World Rugby Hall of Fame has welcomed visitors from across the globe since opening its doors in 2016, but we have launched the Annual Entry Pass to give rugby fans in the birthplace of the game and across the Midlands an opportunity to enjoy extra benefits from having a world-class visitor attraction on our doorstep. With the Rugby World Cup taking place in Japan in 2019, we're gearing up for a busy year at the Hall of Fame and have a number of exciting events in the pipeline to celebrate the world's top 20 teams competing to lift the Webb Ellis Cup. The World Rugby Hall of Fame is a very unique, special and engaging celebration of rugby’s history, values and the stars of the game, both past and present. With regular updates to memorabilia, new innovations and interactive features, the new Annual Entry Pass provides a great opportunity for the local community to further embrace the World Rugby Hall of Fame and support the game. 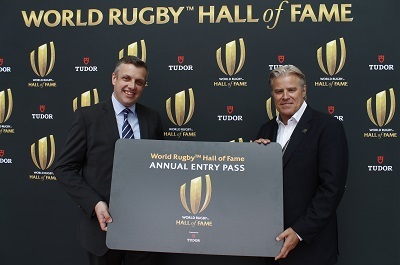 Photo caption: Cllr Michael Stokes, leader of Rugby Borough Council and Brett Gosper, World Rugby Chief Executive Officer, launch the Annual Entry Pass at the World Rugby Hall of Fame.